In Parshat Behaalotcha, the Torah speaks of the Kohen Gadol Aaron kindling, lighting the Menorah. As with much of Torah, this seems straightforward enough. Of course he would light the menorah. However, as with much of Torah, things are not as simple and straightforward as they might seem. We find our insight into the deeper meaning by looking closely at the specific words of the parasha. Rather than the verb we would most associate with the lighting of a menorah (l’hadlik), the Torah uses the verb behaalotcha. Rashi teaches that the verb behaalotcha is used to make the point that the flame goes up [al shem sh’halaav oleh] and that in lighting the menorah the Kohen must be certain that with each candle/wick the flame will remain lit on its own. Sefarim explain that, likewise, one’s relationship with God, one’s spirituality, must remain constant even when it continues beyond the care of the one who initially “lit” it; the flame of godliness must never extinguish. In this context, it would be wise to recall that the kohanim were not only ritual functionaries or even spiritual leaders. They were educators. In lighting the menorah, they enlightened the people. They bear responsibility for making sure that, lit properly; their “candles” remain lit. And we, the people, are like candles. Once “lit”, we must remain a source of light. Once again, in Aaron we see an example. Anyone could perform the physical task of lighting the menorah. Only a true leader and teacher could behaalotcha – kindle it so that it remains lit. That, ultimately, must be the goal of every teacher and school. “Covering” material is not enough. ”Introducing” material is not sufficient. “Proficiency” falls short. Quantifiable skills might be the flame but it requires something else, something more for the flame to remain after class, after graduation, after the gaze of the teacher is turned to the next generation of learners. Our schools, yeshivas, day schools – must set a basic goal, to be sure that by the time our graduates walk out of their high school graduations the flames of knowledge and inspiration and godliness burn bright and are able to continue to burn on their own! 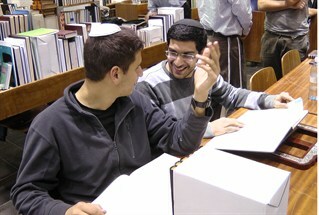 It is not enough to “graduate” our students and then send them off to a gap year in Israel, passively assuming that the experience will be enough for them to gain a real understanding and appreciation for Judaism, for real Torah learning, for a lasting commitment to what it means to be a Jew. If we are expecting that year to accomplish the essential task of Jewish identity, it is not enough to simply question the time and money investment of fifteen years of Jewish education! It is, by definition, a condemnation of the Jewish education we have provided. The year in Israel should be the welcome dessert to a great feast, not the feast itself. If it is the feast itself, then we have failed to prepare our students; failed to make sure our children are able remain inspired on their own! Why not simply rely on the gap year in Israel? Why not be satisfied that our sons and daughters have been exposed to and become proficient in Chumash studies, Nevi’im, halacha, tefilah and Talmud during their schooling and then let the powerful Israel experience infuse them with passion and joy? Undoubtedly, there will be those who, with God’s help and their own conviction and inner strength will retain what they gained in Israel, and build on it for a lifetime. Their Israel experience will inform how they raise their own children and the kind of home they will have. But what of those who return from Israel and less than a year later, have failed to retain any of the benefit of that year? For many, the next stage in their lives, going off to a secular college, will prove to be overwhelming. One year is not enough. Unless the foundation of those twelve to fifteen years of yeshiva was rock solid, unless that education lit a flame that cannot be put out, the next generation will be in jeopardy. Rather than getting “burned out”, our modern day kohanim must rethink curricula, focus, and goals of today’s schools. For the Israel year to be the delicious dessert, the schools must be the nourishing feast. Too often, we are learning that the “foundation” is not strong enough. After yeshiva, summer camps, NCSY Shabbatonim, the March of the Living, after the gap year in Israel (costing parents at least a quarter million dollars per child!) our young people are leaving for secular colleges where they encounter ideas they are ill-prepared to counter and forces they are weak to withstand. Too often, our “hope” to counter the weight of the secular world, is the experience of the gap year; that wonderful year in Israel. But the “mountaintop” experience of that year is very often not enough to carry them forward. If it was, then Rabbi Yankie Schwartz would not have needed to write his thoughtful and caring book, “Keeping the Spark Alive, Making Your Year in Israel Experience Last”. (Mosaica Press 2016) But his book is important. Doesn’t the title make you sit up straight? What is he suggesting? That the experience won’t last? In his book, Rabbi Schwartz sensitively touches on long lists of factors to be found back home that need to be well thought-out and effectively dealt with before sending our children away, let alone before they come back home. Yes, home. The Israel experience is always a great, super, uplifting, inspiring, “awesome” (you pick the superlative) but do any of those feelings last? Home is where all the pressures and interpersonal dynamics that existed before the Israel year still linger. Routines. Siblings. Subtle and not-so-subtle criticisms. Rules about Internet use and curfews. Home is where our young people are tested each and every day; where they have to experience life, make or refuse to make compromises. And think how much more intense all these challenges will be if they choose to attend a secular college or jump into the secular city! What a battle, indeed. Rabbi Schwartz emphasizes again and again the need to connect with a rav and / or rebbetzin while also retaining the connections with those who inspired them in Israel. Like the aroma of the b’samim at havdalah, the feeling must linger. We see more and more of our young people fall away during their secular college years. Even if they are prepared to stand against the withering criticism of Israel on college campuses and can argue against the Divestment movement, we cannot imagine the insidious and constant sensibility against which they must exist. The very language that they speak calls into question the traditions we embrace. To speak of gay and lesbian relations is as comfortable as talking about the weather. Non-gendered bathrooms are fast becoming the norm. Moral equivalencies exist where there should be none. Have we prepared our sons and daughters to live in that environment? Why would we want them to experience that environment? At what cost? Are their flames strong enough to cast light through that darkness? How do we ensure that the year in Israel is a benefit and not just an expensive vacation? More books? More media? Better computers and faster Internet access? Of course not! The answer is not with what is quantifiable but with the impact of the one who lights the wick! When a student knows the reasons for the mitzvot then he will continue to burn bright! Aaron was not dulled by tenure or job security, by frustration or unruly students, by the same material and words. Rather, he was inspired by the source of his calling. He is the model for the teacher whose consistent and continued enthusiasm and idealism catches on like fire among students eager to imitate their hero, their teacher or rebbe, and it is this heroic accomplishment which merits great praise. Students must equally be inspired by the source of their calling. The educational implications to Aaron’s response are legion. The most obvious being that the excited, idealistic and enthusiastic teacher should expect similar reactions and responses from his students. If those reactions are not forthcoming, there is something very wrong. Conversely, the bored, dull, unsympathetic teacher dragging himself into class only to do his job, should not expect anything other than yawning, disinterested, disgruntled and eventually resentful students. To teach well means to enlighten, inspire, motivate and raise students to the point at which their inner flames automatically ascend. Students must ultimately become reflections and mirrors of great teachers and lasting lessons.